Custom mobile phone wallet. 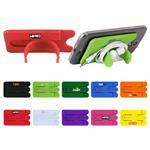 Can be used with most smart phones to carry ID, credit cards, business cards or more. 3M sticky mobile pocket. 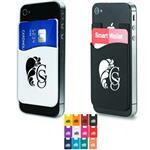 Mobile pocket wallet convenient storage for business cards, credit cards, and identification. Adheres to back of mobile device. Instruction card included. 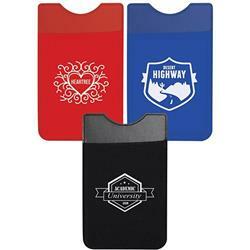 A RUSH PROMOTIONAL ITEM - FREE 1-DAY RUSH PRODUCTION AVAILABLE! Production Times Available: FREE 1-DAY RUSH PRODUCTION AVAILABLE! 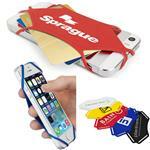 Lycra wallet for Smart Phones.